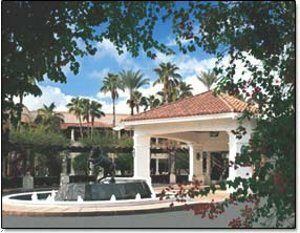 Scottsdale Resort and Conference Center is a tranquil oasis with views of the surrounding championship golf courses and Arizona*s rugged mountain scenery. Modern amenities and technology wrapped in the old-world charm of historic hacienda decor. Lush landscaping, peaceful patios, and award-winning cuisine. Two heated pools, Spa, salon, fitness center, 4 tennis courts, lounge and billiards room, business center. 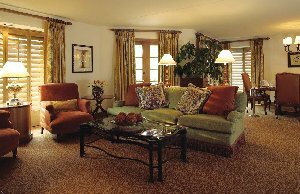 The Resort*s 326 guest rooms and suites are located on three floors in the main building and in the private Casitas along the golf course. Extensive meeting facilities with 50 flexible meeting rooms including 3 beautiful ballrooms. 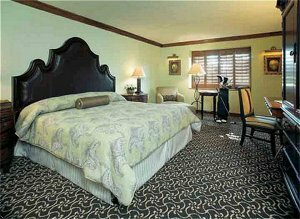 Spacious Room with 2 Queen Beds, includes 25 percent discount off food and beverage. Deluxe room with 1 king bed, includes 25 percent discount off food and beverage. 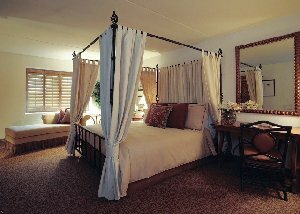 Spacious deluxe room with two queen beds, warm hacienda decor, high speed Internet. 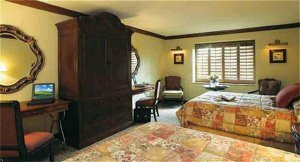 Spacious deluxe room with one king bed, warm hacienda decor, high speed Internet. Entrance for two to Rawhide Western Town Dinner for two to Rawhide Steakhouse One night in our newly renovated Deluxe queen with a wild night with dinner for two at Rawhide Western Town & Steakhouse. From Sky Harbor International Airport- Take Loop 202 East. Follow it to the Loop 101 North Exit. Take Loop 101 North to Indian Bend Road. Exit on Indian Bend left, going west. Turn right on Hayden Road. Turn left on McCormick Parkway. The Resort is on the right side of the road with access at 77th Place. The award-winning Palm Court offers gourmet dining for breakfast, lunch and dinner. Dinner accompanied by the soft strains of acoustic guitar. We offer the Valley*s best Champagne Sunday Brunch from 11am-2pm. Cost $38.00++usd/adults, children under 10, $19.00++usd, children under 5 eat free. Average Palm Court entree ranges: Breakfast from 10.00usd-15.00usd pp. Lunch from 10.00usd-25.00usd pp. Dinner from 25.00usd-40.00usd pp. Reservations for Palm Court strongly suggested. Casual dining available in The Vista Verde; often includes lavish breakfast and lunch buffets; children*s menu. Light fare offered in Sangria*s Bar and Billiards Room that also has a beautiful patio with a firepit and hearthside seating, right on the golf course. Room service available from 7am - 11pm. America West Arena/Bank One Ballpark - 25 minutes Arizona State University - 20 minutes Championship golf - on site McCormick-Stillman Railroad Park-just voted in Zagat survey one of top 50 Attractions by Child Appeal in Nation and Best Park in Phoenix-less than 5 minutes away. Frank Lloyd Wright*s Taliesin West - 20 minutes Grand Canyon - 3 hour drive Old Town Scottsdale - 15 minutes Scenic Sedona - 90 minute drive Camelback Mountain - 10 minutes Rawhide 1880's western town - 20 minutes Desert Botanical Gardens - 15 minutes The Resort is a 15 minute drive to the Arabian Horse Show, Barrett Jackson Car Show and Phoenix Open. The two 18 hole championship courses of McCormick Ranch Golf Club surround the resort. Talking Stick, a Troon Golf course, is a 5 minute drive away. The renowned Tournament Players Club, home of the Phoenix Open, is only 15 minutes away. Concierge can arrange for transportation and tee times. Two sparkling heated pools and large outdoor jacuzzi, adjacent walking/jogging trails. Bike rentals available. Basketball court at no charge. Tennis courts can be reserved for 6.00usd an hour; lit for night play. The fitness center with free-weights, treadmills, eliptical machines, stationary bikes available, facilities use 10.00usd a day. The spa offers a variety of treatments, including Swedish massage at 95.00usd an hour, aromatherapy, seaweed wraps or hot stone massages. Ask about the Spa Revitalizer package. Fitness Center hours are 530am to 10pm. Two casinos with live entertainment nearby. Concierge can arrange horseback riding, Jeep or Hummer tours, hot air balloon rides, city tours and numerous other recreation options. One of the premier conference resorts in the nation, offering 50 meeting rooms encompassing 50,000 square feet. Wide variety of flexible meeting space for groups from 10 to 1,000, including the 10,000 square foot Grand Coronado Ballroom. Three conference rooms with rear screen projection. Staff of professional, dedicated Conference Planners. Media Center with a 2 million usd equipment inventory. Business Center provides PC and Mac support, secretarial services, shipping, equipment rentals, copy services and internet access. Videoconferencing available.